For most home or business, wastewater flows by gravity (without pumping) from the building sewer line to the public sewer main where it travels to the wastewater treatment facility. However, because of elevation, groundwater conditions or significant rock formations, conventional gravity flow systems may not work. In these cases, a grinder pump system is necessary. A grinder pump works like a household garbage disposal, but on a larger scale. It grinds up wastewater produced in your home (i.e. toilet use, shower, washing machine, etc.) and pumps it into the public sewer system. The grinder pump is placed in a tank that is buried in a convenient outdoor location on a homeowner’s property. The access cover to the grinder pump will be visible in your yard. Always keep this area clear as this hatch is necessary for repairs and maintenance. The tank provides wastewater holding storage capacity. When water is used in the house, wastewater flows into the tank. When the wastewater in the tank reaches a pre-set level, the grinder pump automatically turns on, grinds the waste and pumps it out of the tank via the homeowner’s building sewer line and into the public sewer system. A grinder pump will normally run for one or two minutes and automatically turn off when the tank is emptied. The pump is powered by electricity and is connected to a control panel. 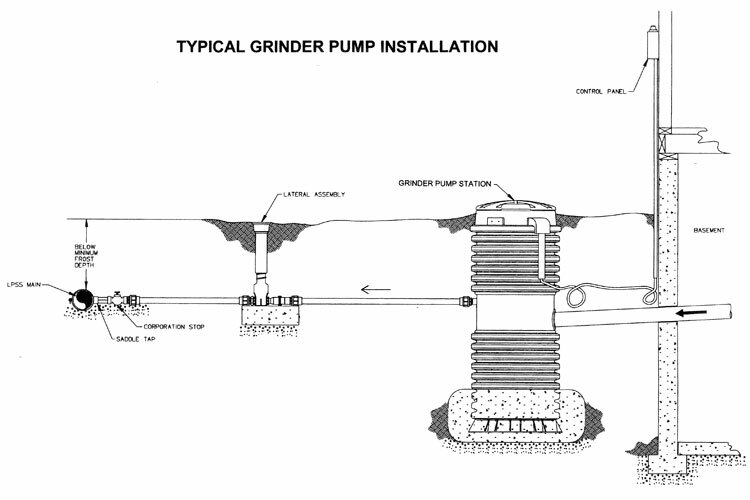 A drawing of a typical grinder pump installation is shown below. It is the responsibility of the property owner to maintain and keep the grinder pump in good working order. If you are not sure if your property is service by a grinder pump, please contact the Sewer Authority for assistance. Should your pump stop working, contact the company that provided the pump for service – the phone number will be located on the control panel. Remember that your grinder pump is powered by electricity. In the event of a power outage, your pump will not work, unless it is powered by a generator. You should limit water usage in the house to the bare minimum during a power outage. A properly maintained grinder pump should be able to handle wastewater from the kitchen, bathroom, laundry, etc. Some chemicals and substances can adversely impact a grinder pump and may cause safety hazards. Refer to the labels on all chemicals before using and disposing. Grease – a byproduct of cooking that comes from meat fats, oils, shortening, butter, food scraps, sauces and dairy products. These items should ALL be disposed of in your garbage and trash containers. These items can damage the grinder pump and its controls, cause blockages and backups and may create unsafe conditions in your lines and tank. Also, never connect a sump pump to sanitary sewer lines. A sump pump connected to a grinder system will increase your electric costs and shorten the life of your grinder pump, and could also overload the pumping capability of the grinder pump, causing a backup. Doing so is also a violation of local regulations and increases wastewater treatment costs.